Oh, the sweet, breezy, untroubled Saturday Morning. When it’s the sun that finally coaxes you awake (no need for that jarring cell phone alarm). And it’s within your rights to hop back into bed to have your morning cup of coffee or tea. And then fall back asleep for an extra fifteen minutes. And goodbye to the usual microwave-warmed instant oatmeal (convenient for grabbing on the way out the door) – you’ve got all the time in the world to cook up a feast for breakfast. My favorite on lazy mornings is a bacon, egg, and cheese sandwich. But I needed to add some fresh, nutritious produce to transform the dish into something Scrumptious Pumpkin –ready. 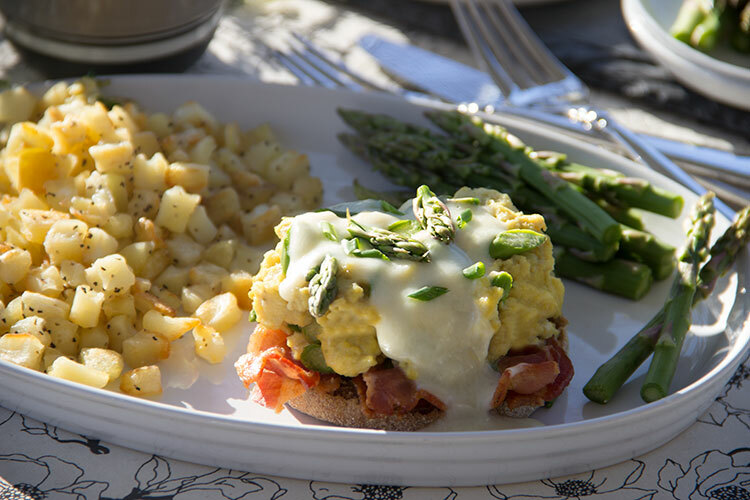 I knew bacon and egg were classic pairings for fresh spring asparagus, so I thought: why not add chopped asparagus to an egg sandwich? I also used shallots and chives to add tons of additional flavor. And I ended up with – far and away – the best breakfast sandwich I’ve ever made. And yes, this is also quick and simple to make. Because I know that’s another requirement for lazy Saturday mornings! Here’s everything you’ll need to make this dish. Begin by preparing the bacon. Yes, I managed to sneak bacon into this “skinny” breakfast sandwich! Because – as much as I strive for a healthy diet – what’s life without a little bacon every now and again? 2 slices have about 47 calories, 3 grams of fat, and 1 gram of saturated fat. 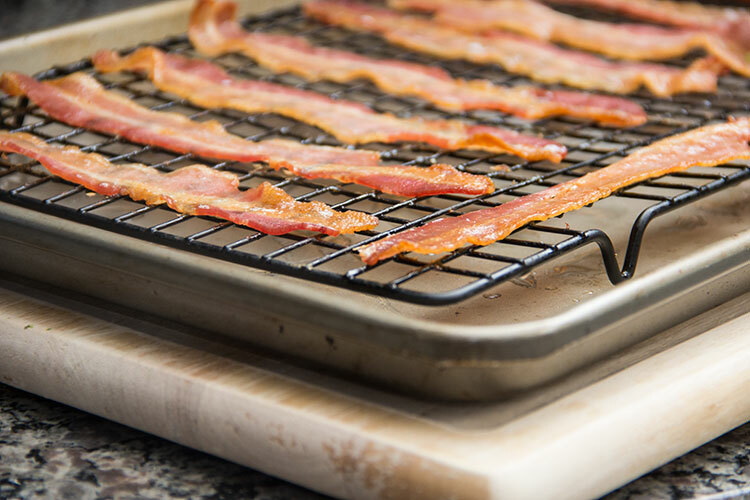 Place a wire rack on a baking sheet and arrange the bacon on the wire rack so no two pieces are overlapping. Then cook the bacon until it begins to turn golden and form tiny bubbles along the top of the bacon. Carefully, very carefully – there will be hot bacon grease on the pan – place the baking sheet on the counter to cool. Note: the bacon will continue to crisp as it cools, so you’ll want to remove it from the oven before it becomes too crispy. Next, grab some fresh asparagus. Hold one spear at each end and snap it in half – the end that naturally breaks off is the tough part that should be discarded. 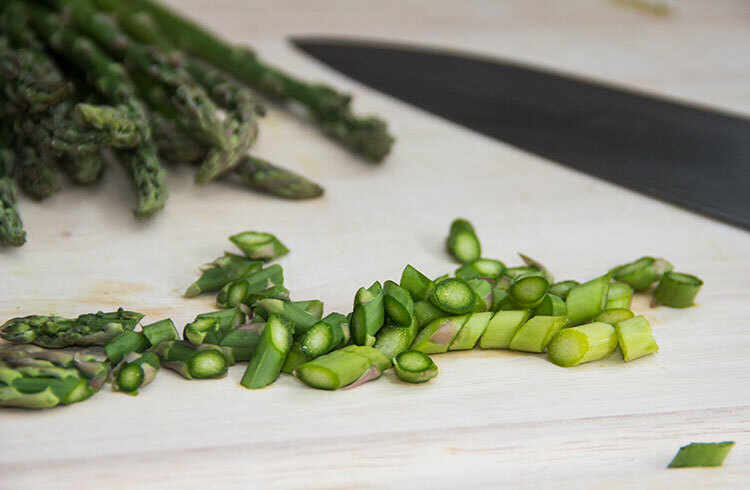 To save some time – so you don’t have to snap every piece individually – grab a small pile of asparagus and trim off the ends in one chop, using the broken piece as a guide for how much to chop off. Then run your knife through the pile of trimmed spears, cutting them into quarter-inch pieces. 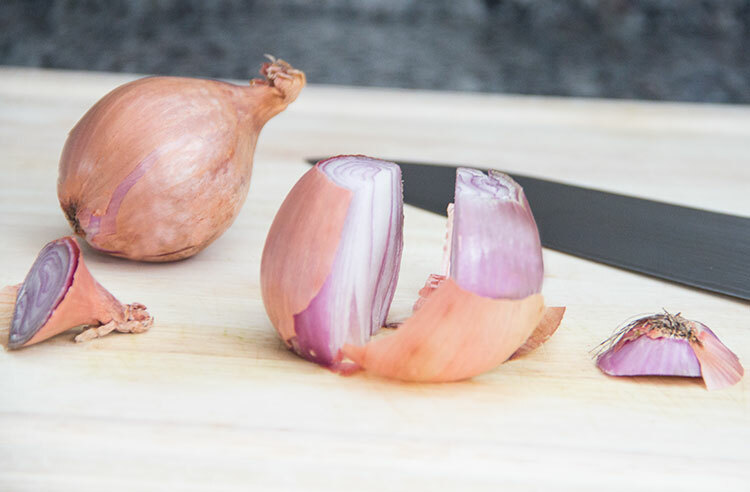 Grab a shallot and cut off both ends. Then slice it in half lengthwise, making it easy to peel off the skin. Place one half flat-side-down on the cutting board for stability. 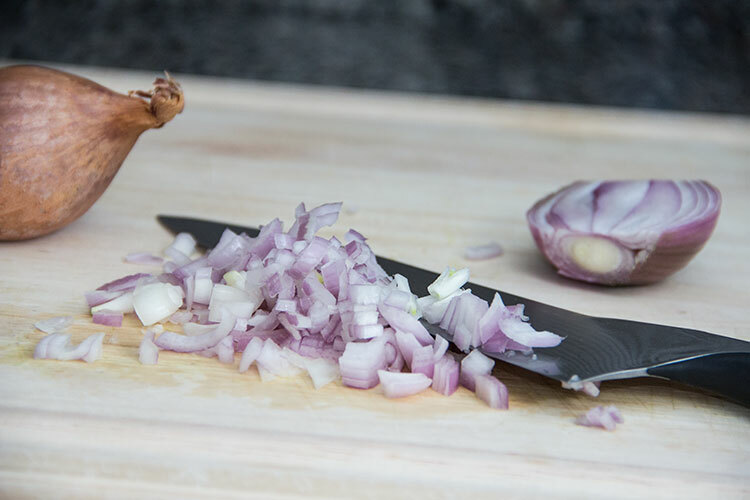 Then run your knife in the opposite direction, dicing up the shallot into bite-sized bits. 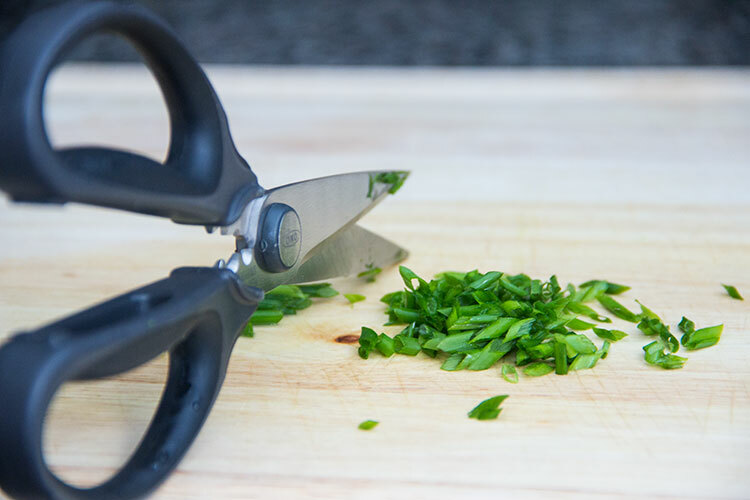 Grab a small bunch of fresh chives and use some kitchen shears to chop up the chives (or use your knife if you don’t have shears). 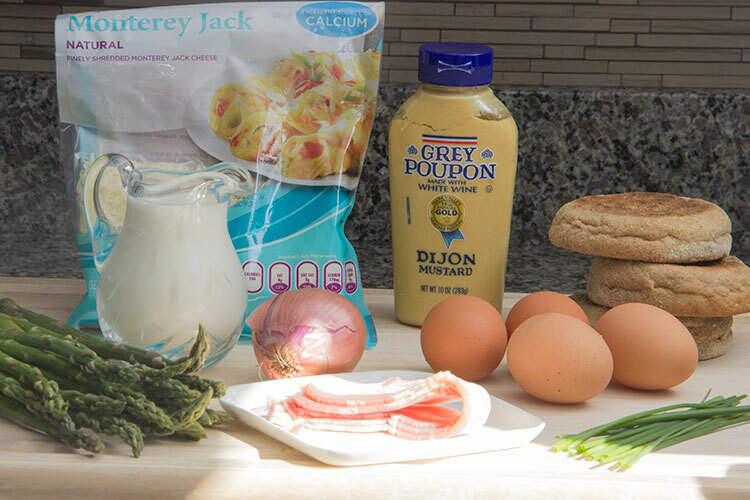 Even though this is a “skinny” breakfast sandwich, I use the entire egg – yolk and all. Because I don’t eat eggs every day and – although they do contain some fat and calories – egg yolks also contain most of the nutrients found in eggs. Egg yolks contain tons of minerals plus a lot of Vitamin D (for healthy bones and a strong immune system) and Vitamin A (for beautiful skin). And – despite the old beliefs about eggs and cholesterol – new research shows that one egg per day (as part of a healthy diet) does not increase the risk of heart disease or stroke in healthy people. Break six eggs into a large mixing bowl and add a bit of 1% milk. Then whisk vigorously – with all the strength you can muster for a lazy Saturday morning – until all the yolks are broken and well combined. Heat a bit of olive oil in a large sauté pan over medium heat. 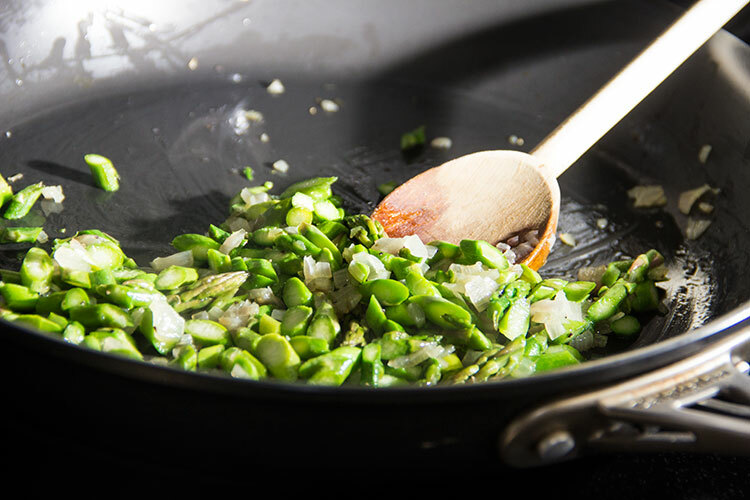 … and then add the asparagus. Cook a couple of minutes more, then reduce the heat to medium-low. Add the egg mixture and allow the eggs to begin to firm and set along the bottom of the pan. Season with salt and pepper, then grab a wooden spoon or rubber spatula and regularly scrape and fold the eggs until the eggs are no longer liquid. Remove the eggs from the heat. Note: the eggs will continue to cook a bit after you’ve removed them from the heat, so you want to cook them just until they are solidified and no longer liquid. Place a small saucepan over the burner, still set to medium-low. Heat some 1% milk in the pan until it’s lightly simmering. Then add some shredded Monterey Jack cheese and some Dijon mustard, and turn off the heat. Stir until the cheese is all nicely melted and gooey. Then immediately assemble your breakfast sandwiches while the eggs and cheese are still hot! Grab some whole wheat English muffins that have been cut in half and toasted. Add two slices of bacon to each half. Top with some of the cheese sauce. And then add a few chopped chives. 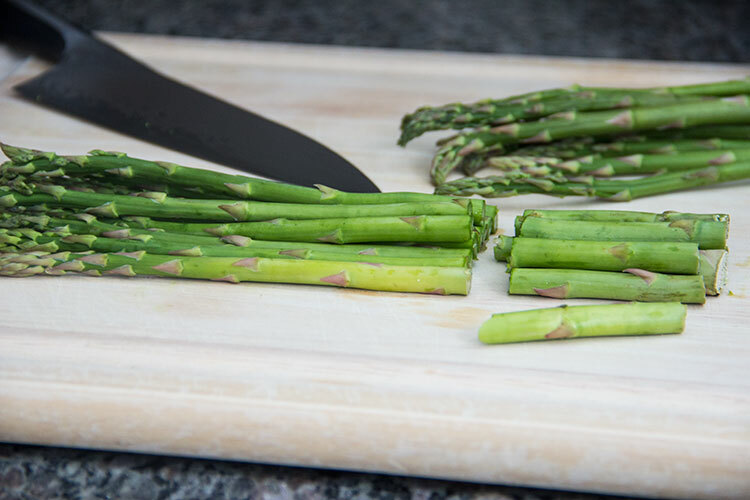 Then serve it up with a side of crisp, grilled asparagus. This is a very richly flavored, very indulgent-tasting breakfast sandwich. 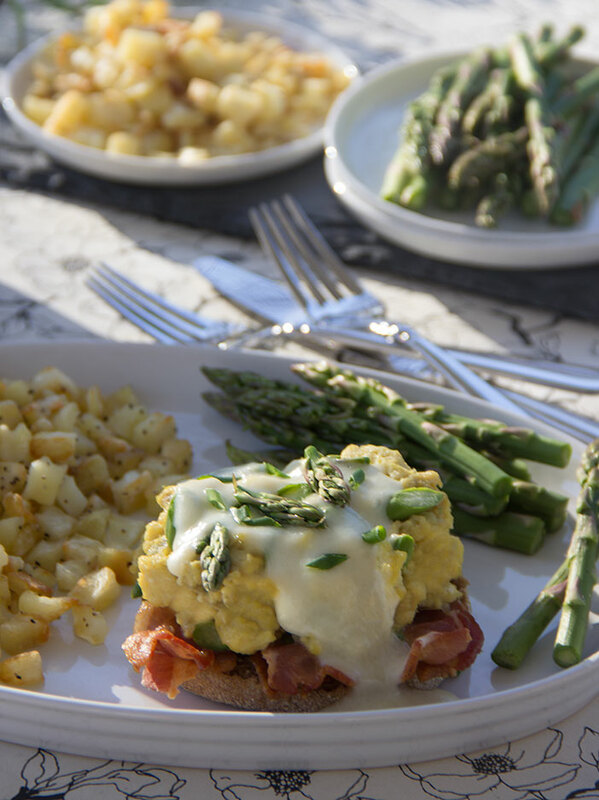 The asparagus and shallots are perfect complements to the fluffy eggs and crispy bacon. And the melted cheese makes it very decadent, filling, and satisfying. More good news: I did the math, and one open-faced sandwich (this recipe makes a total of 4 servings) averages a reasonable 350 calories! Does a lazy Saturday morning get any better than this? Place a wire rack on a baking sheet and arrange the bacon strips on the wire rack so that no two pieces are overlapping. Cook the bacon about 8-10 minutes, or until small bubbles form and the bacon begins to turn golden. Very carefully remove the baking sheet from the oven, taking care not to splatter any bacon grease. The bacon should continue to crisp a bit as it cools on the counter. Meanwhile, add the eggs and 3 tablespoons milk to a large mixing bowl. 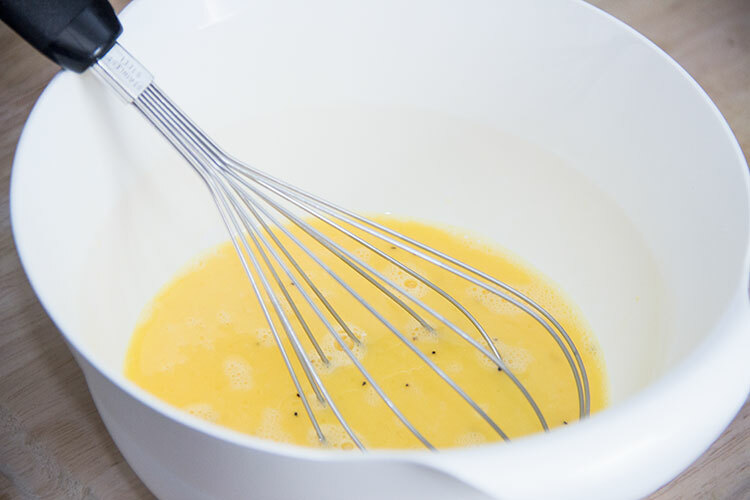 Whisk vigorously until all the yolks are broken and well combined. 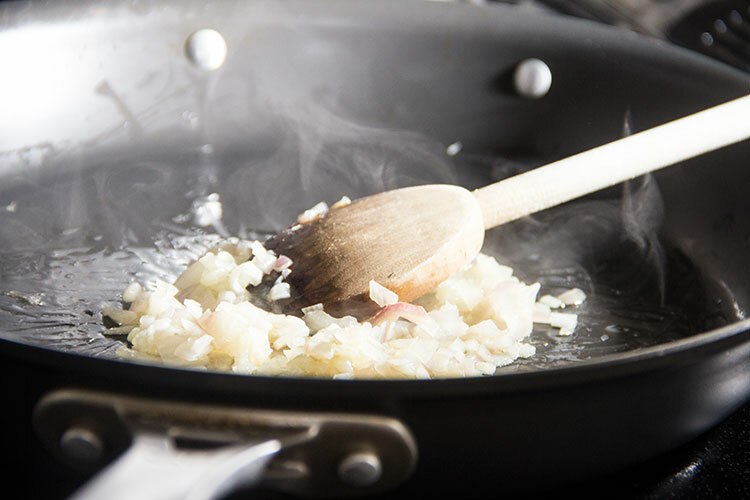 Heat the olive oil in a large sauté pan over medium heat. Cook the shallot about 2 minutes, or until it begins to soften. Add the asparagus and cook about 2 minutes more. Reduce the heat to medium-low. Add the egg mixture to the pan, and allow the eggs to begin to set along the bottom of the pan. Season lightly with salt and pepper. Then scrape and fold the eggs regularly with a wooden spoon or rubber spatula to ensure the eggs do not stick to the bottom of the pan. When the eggs are just solidified and no longer liquid, remove the pan from the heat. 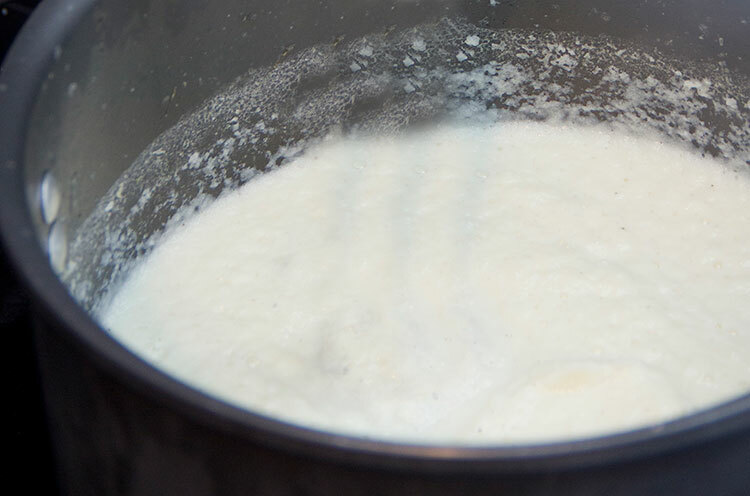 Add ⅓ cup milk to a small saucepan over medium-low heat and bring it to a light simmer. Add the Monterey Jack cheese and the Dijon and turn off the heat. Stir until well combined. Immediately assemble open-faced sandwiches: arrange two bacon strips over each toasted muffin half. Scoop a generous portion of the scrambled egg mixture over the bacon. 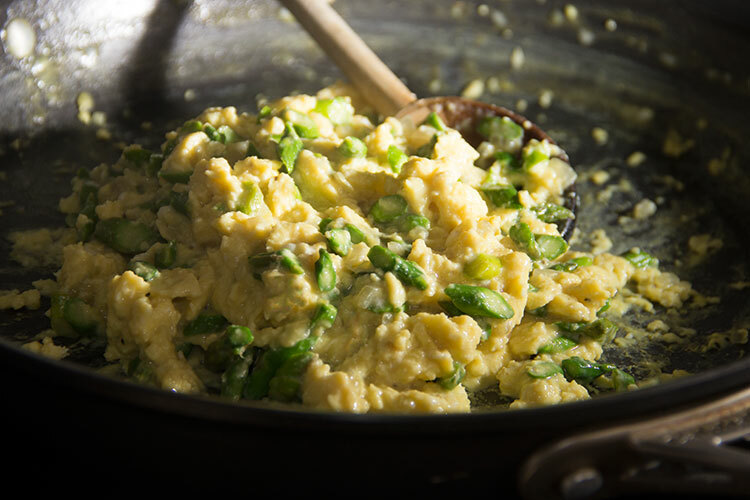 Spoon some of the cheese mixture over the scrambled eggs. Top with freshly chopped chives. Serve. This is my kind of breakfast sandwich! It sounds wonderful! Wow, Jen, these look fantastic. I like how you’ve skinnied them down too so that they aren’t the typical American greasy-spoon breakfast sandwich. I could see making a few extras of these on a Sunday night and having a few days of tasty breakfasts…. This is a delicious, well balanced gourmet breakfast! Love the combination of flavors and textures. 1. 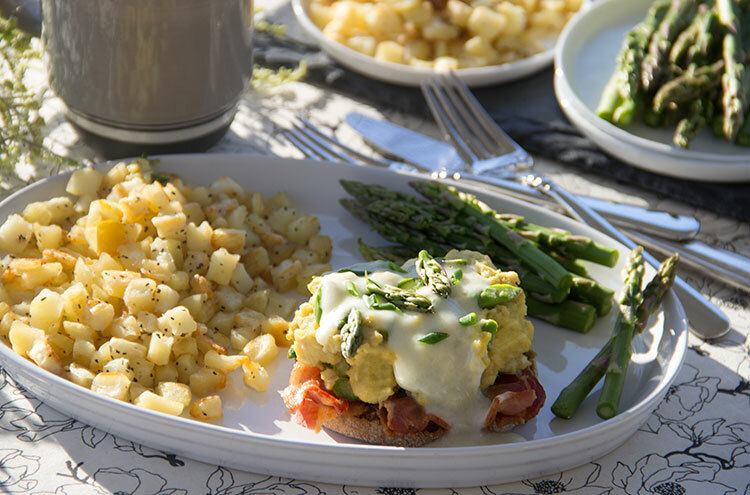 Completely unfair that you posted such a delicious lazy Sunday morning brunch recipe on a Thursday (here in Australia) now I have to wait 3 days :’-( Whaaaaaaa! unfair! But cheers for reminding everyone that egg yolks aren’t the devil! Without egg yolks the world seems a little darker. I will have to bookmark this one and try it when we’re back in Canada and can get all the ingredients! The eggs that I buy at the street market here in China are fabulous but sadly, there’s no bacon to be found, cheese is hard to come buy and very expensive and we can’t even get milk! Oh boy. I need to make these this weekend. PERFECT BRUNCH. Mmm love how you snuck some healthy bacon onto this sandwich! 🙂 Looks so good! This sounds awesome! I definitely need to try making a vegetarian version with veggie “bacon” or tempeh “bacon.” Yum! What a tasty savory breakfast option! This is such a fun breakfast! 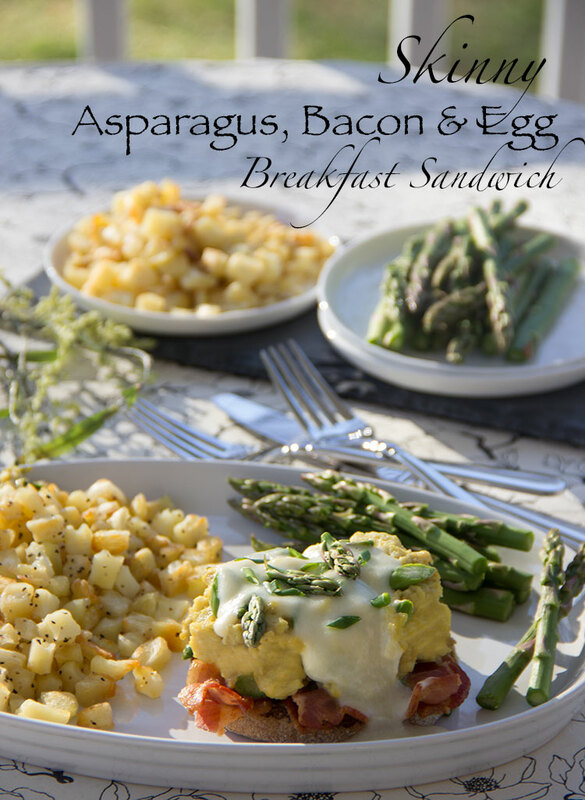 I love filling yet healthful breakfasts and these breakfast sandwiches look perfect for me! Every day should begin with one of these bad boys! What a lovely breakfast…it would be perfect for Mother’s Day. These sandwiches look like a wonderful splurge for weekend breakfasting. 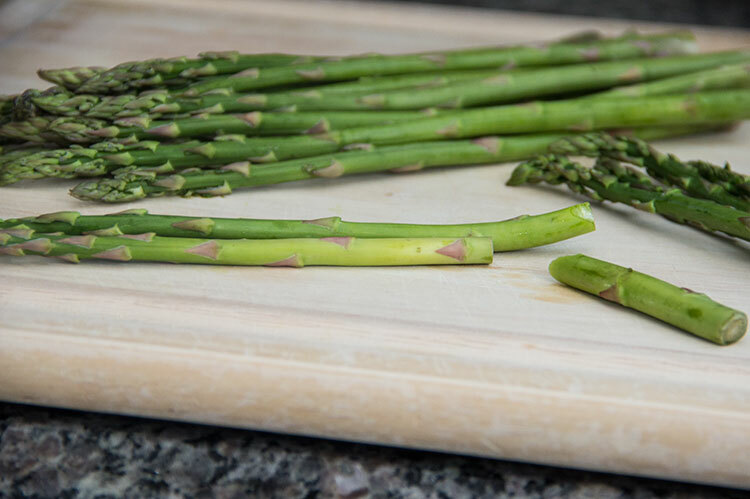 Love the addition of asparagus, as it’s one of my favorite vegetables. Yum! This looks like one seriously dreamy breakfast! Omygoodness this looks fabulous. I wish I would’ve seen it for Mother’s Day brunch! 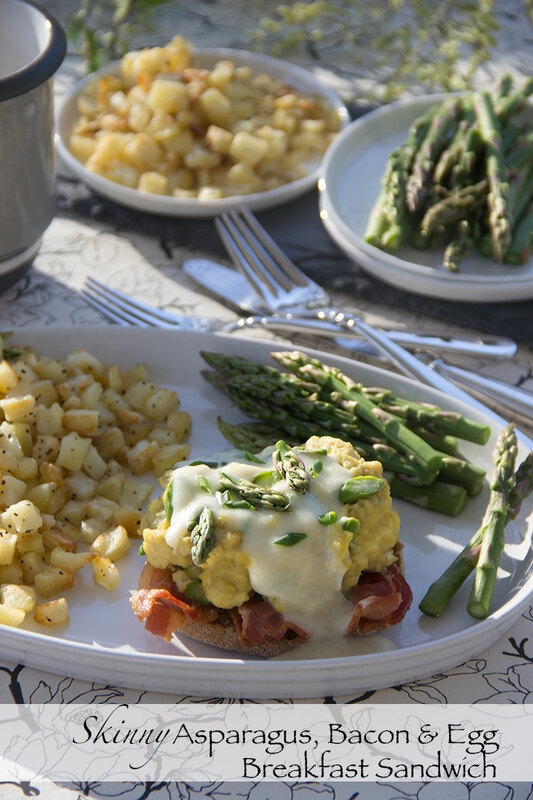 This would’ve been so yummy, love the addition of asparagus with that sauce! No MUST attached – if you don’t feel for it. This is just would I love to have in front of me this morning …. wonderful start of late start of a day. And I want sunshine on my plate too. That’s not a sandwich that is a beautiful meal that I would enjoy any time of the day.